Every job has its perks and its pitfalls. The benefits of writing about food, travel, wine, and bourbon are that I get to travel and then consume copious amounts of phenomenal food, wine, and bourbon. The downside of this career choice is that I come home and cook more great food to photograph and share the recipes, drink more wine while in the kitchen preparing these dishes, and then sit all day and write about it. And you say, “What’s so bad about all of that?” There are a number of potentially adverse side effects that I could write about, but let’s just say my body is craving a reset. It’s time for a lifestyle change. Yesterday I started a three-day detox plan (I figure I can do ANYTHING for three days). While the majority of the cooking I do at home is based on the Mediterranean diet and we don’t need a radical change, we do need to make some adjustments. I thought the detox was a good way to get things in motion. I always find dining out to be the greatest challenge; whether when traveling or having an evening out with friends, it’s hard to avoid rich foods, not drink wine, or tip back a bourbon. My plan for this year is to enjoy everything in moderation and kick up the exercise plan. Mr. B is not nearly as enthusiastic about this detox process as I am and has decided to opt out. Totally. He will be dining on his homemade frutti di mare, sipping a Tuscan wine, and enjoying a late night bourbon while I am slurping down a concoction consisting of mango, blueberry, coconut water, kale, lemon, avocado, cayenne pepper, and flax seeds for dinner. Then I will head to the comforts of my hydrotherapy tub for the evening’s finale, a detox bath with Epsom salts and lavender oil. Not too shabby, huh? So far, so good. Before embarking on this journey, I did splurge over the weekend and spent days in the kitchen cooking and baking. We nibbled on a spicy shrimp tapas and some other dishes, ending one evening with a delectable dessert: a dark, decadent, rich, and, creamy chocolate dessert. Worth. Every. Calorie. Dark chocolate, when the percentage of cacao is at least 70%, is considered a super food by many health experts and is included in many lifestyle diets. The antioxidants in dark chocolate and cacao (flavanoids) protect the arteries by helping them to relax, allowing for better blood flow. A quarter ounce of dark chocolate every day has been shown to lower blood pressure without weight gain. Since almonds are also a super food, the ideal combination is a small piece of dark chocolate with almonds each day. My favorite brand of dark chocolate with almonds also has a touch of sea salt. It is my nightly splurge (which is on temporary hiatus). 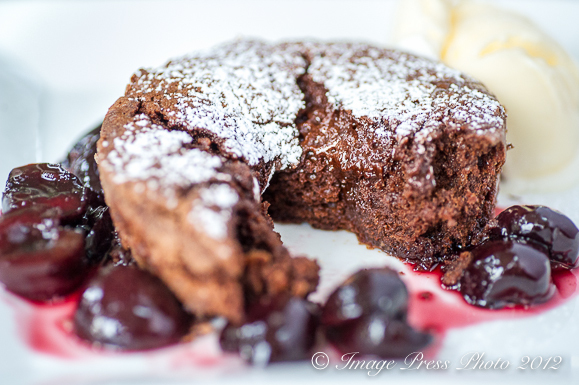 Warm Chocolate Truffle Cakes with Brandied Cherries were the perfect end to my “Last Supper” before the detox. While I only indulged in a small portion of the moist and mousse-like gem, it satisfied my craving for something totally luscious, rich, and chocolatey. These cakes are not molten cakes, so they will not have a gusher of hot chocolate lava ooze from their center when you first delve into the cake. Rather, they have a truffle-like consistency that is velvety and completely decadent. Be sure not to overcook the cakes. You want the centers loose and the consistency of a mousse. I used gorgeous cherries that were in my freezer from my friend’s farm and orchards in Montana to make the brandied cherries and I served the dessert with vanilla ice cream. The recipe for this dessert is from Small-Batch Baking for Chocolate Lovers, by Debby Maugans. I love this cookbook because it allows me to make small servings, in this case I made two truffle cakes, which was the perfect amount for the evening. Leftovers of this divine truffle cake would be too much of a temptation. With the high cost of quality ingredients, like good chocolate, we don’t want waste, and we know Mr. B doesn’t need to eat them all by himself, so recipes for just two are ideal for us. In a few days, when my juice detox is over, while I may not indulge in a dessert as heavenly as this, I will continue to incorporate dark chocolate in my daily routine. It is good for the mind and body and has important health benefits and is also a nice splurge to end your day. 1. Position rack in the center of the oven and preheat the over to 375 degrees F. Lightly butter two 8-ounce ramekins and dust lightly with flour, tapping out the excess. Place the ramekins on a baking sheet for easier handling and set aside. 3. Place the chocolate and the butter in a small, microwave-safe bowl; microwave on medium power for 1 3/4 minutes, or until soft. Stir until melted and smooth. Let cool. 4. Place the egg, egg yolk, vanilla, salt, and the remaining 3 tablespoons sugar in a small. deep mixing bowl. Using a handheld electric mixer, beat the mixture on high speed until pale and thickened, about 2 minutes. 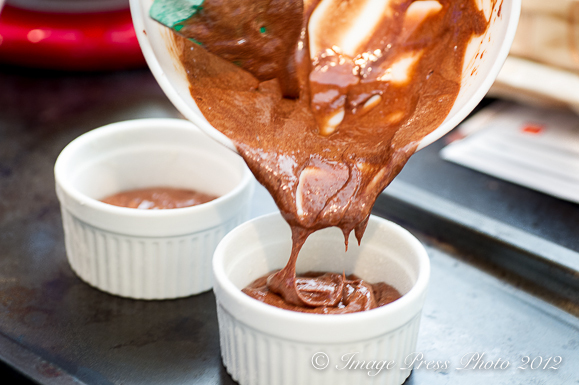 Using a rubber spatula, fold in the cooled melted chocolate. Sift the flour over the mixture, and fold in just until no streaks remain. 5. Spoon the batter into the prepared ramekins and bakes until the cakes have risen, the tops and dry, and the centers are set, just about 20 to 22 minutes. Remove the cakes from the oven and let cool on a wire rack for 5 minutes. 6. Loosen the edges of the cakes by running the tip of a small, sharp knife around them; unmold onto servings plates, rounded sides up. 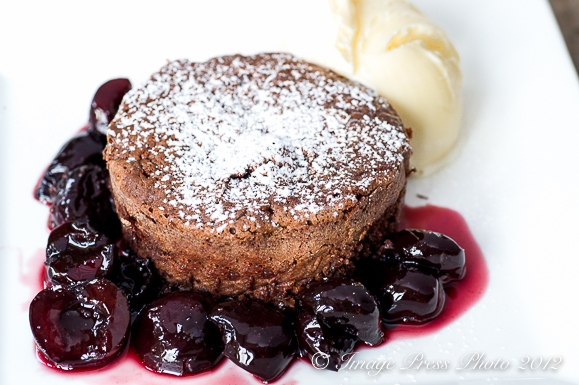 Spoon the brandied cherries and whipped cream (or ice cream) onto the plates; dust with confectioners sugar, if desired. Your lovely, beautiful recipe looks delicious and enticing. I will try it right away. Thank you for using our cherries in another creative way. Oh my gosh, you have reminded me that our pruning starts in February. Winter is too short for us. It is also seed ordering time, too. Thanks for your many, great columns. We are all happy to see a new one entry, from you, in our email. This is the recipe I have been looking for! 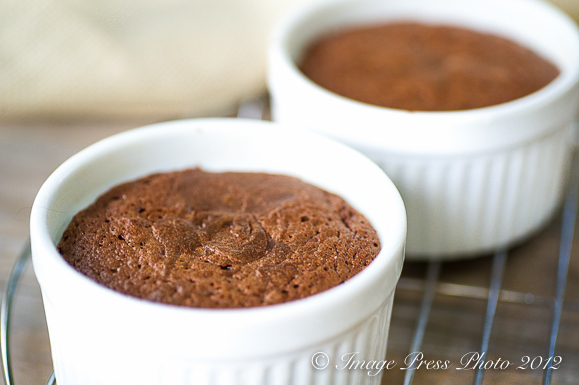 Just two decadent chocolate moelleux… as we call them. And chocolate and cherries with a kick? You know I love this combo. Gorgeous gorgeous cakes and yes the perfect “last dessert”. Just be careful after the 3 days are up that you don’t celebrate with more of these babies!